“I am a mother of five, my first born child is fifteen years old, and my last born is two. We eventually moved to a village nearer the town center. My kids finally joined a school nearby. I am hopeful they will have a better life than mine. “Roda is shy, she keeps her head bowed half of the time we are having our conversation and speaks in halting whispers, she only looks up and nods in the affirmative when I ask her if she received some money via the HSNP (Hunger Safety Net Programme) E- Wallet mechanism. We are standing directly opposite one of the watering points in Kakuma; there are several jerry cans on the queue. The respective owners are standing on the side watching over them, not bothered by the scorching sun. They come closer only when it is their turn to fetch water. Looking at them, there is a mixed expression of anxiety and relief - you can tell, this is a game changer. 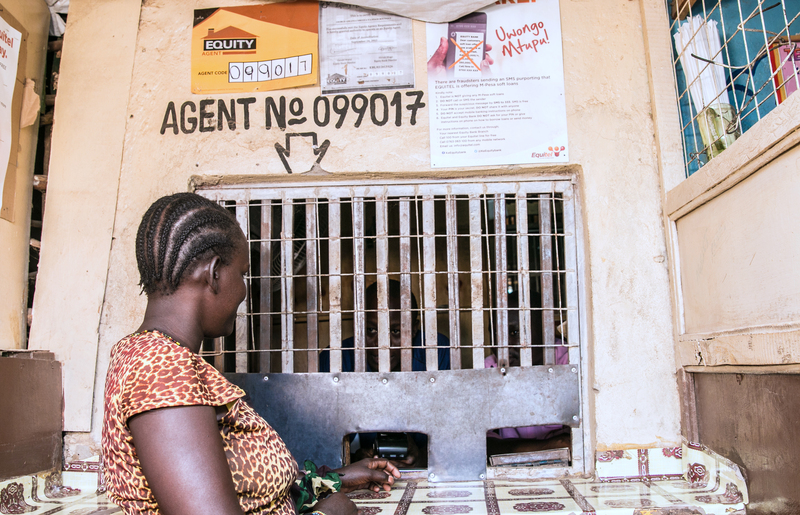 The E-wallet beneficiary carries their HSNP card to an Equity Bank Agent. The agent has a machine configured to show the beneficiary information on the E-wallet. The beneficiary tells the agent to debit the amount that he/she wants to buy the water for on that particular day. The agent then issues a receipt for the amount of water required; each 20 litre jerry can cost KES 5 (0.05 euro). The receipt holder then gives the receipt to the water kiosk vendor and then draws water equivalent to the amount of water redeemed.